Jesus is eating with His disciples and preparing them for what is ahead. He talks to them about the communion that He shares with the Father. Then he explains that they are called to share in that communion. As the meal ends, they continue talking just like you might do with friends after a meal. Sitting on the porch, standing in the parking lot, or walking in the park and talking. In these times, a certain guard is let down and we talk about issues of the heart freely. Jesus is walking with the disciples toward a garden. And we might just have a glimpse of the intimacy intended for man and woman in The Garden. Jesus says, I am the true vine, and my Father is the vinedresser. 2 Every branch in me that does not bear fruit he takes away, and every branch that does bear fruit he prunes, that it may bear more fruit. 3 Already you are clean because of the word that I have spoken to you” (Jn 15:1–3). The disciples are not simply students of the knowledge or wisdom of Jesus. It is more than knowledge it is life: His very life flowing into them. He is suggesting that they and we were created to live out of the abundance of this ever-flowing life, this love-saturated life. He says, “4 Abide in me, and I in you. As the branch cannot bear fruit by itself, unless it abides in the vine, neither can you, unless you abide in me. 5 I am the vine; you are the branches. Whoever abides in me and I in him, he it is that bears much fruit, for apart from me you can do nothing.” (Jn 15:4–5). We’ve grown accustomed to this image of vine and branch and fruit and life. And yet, if we pause and think about it, the image should still strike us as odd. He is comparing this intimate communion to plant life and specifically the life flow in a single plant. A grapevine. The branch abides in the vine. And simultaneously the vine is in the branch. This describes a relational connectedness that is not visible, but it is actual. It is really there. And the disciple simply needs to rest, to abide, to remain. The Apostle Paul will also adopt this vine/branch image to speak our relation to God in Christ. At the same time, he will indicate that he is pressing into this relation: He says, “Not that I have already obtained this or am already perfect, but I press on to make it my own, because Christ Jesus has made me his own.” (Philippians 3:12). He is resting, dwelling, abiding, and he is also pressing, seeking, running the race. Even as we are sustained and renewed and directed by the Spirit of God in and through, we are also pressing toward, seeking to grow deeper in communion. The more I read about abiding in Christ, of living in the communion of God, the more I realize that it is bigger than anything I know or we know. Our knowledge falls short. This vital life that Jesus describes is not static. Abiding in Christ describes a dynamic life of ever giving, ever flowing love. In one sense, it might be like entering a river and allowing the rapids to lead me where they may. Or in another sense, it might be like getting in a boat and remaining as the waves and wind lead me to my destination. Sort of like the ancient Christian Celts who are known for getting in a boat and letting God blow them where He will. The saint who inspired so many Celts to get on a boat and travel wherever the Lord might lead is St Brendan the Navigator. His passion for going forth and bringing the gospel to distant lands is believed to be the inspiration for the great Celtic missionaries who would cross Europe and the world. Men like Columbanus and Colmcille followed his lead, and the inspiration continued to stretch across the centuries. 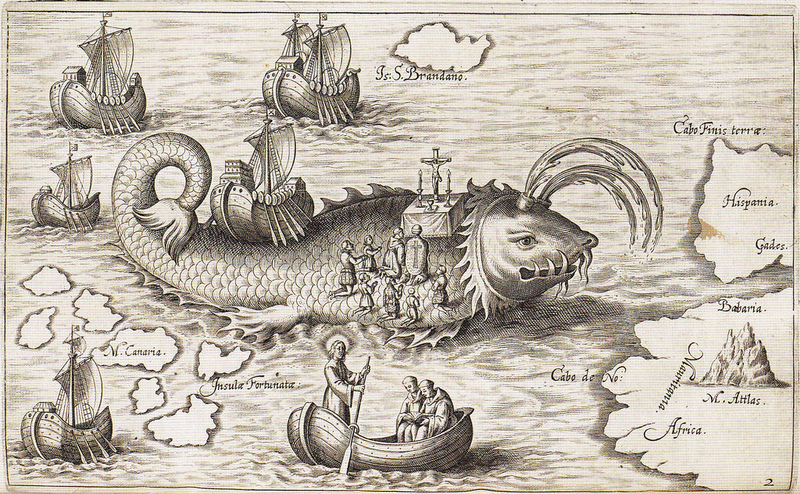 Even Columbus wrote in his diary, “I go to seek the promised land of Saint Brendan”. I am remembering his story today in light of today’s Gospel reading where Jesus speaks of abiding, remaining, bearing fruit. I am thinking of that dynamic tension found in Paul where he is resting, dwelling, abiding, and he is also pressing, seeking, running the race. These two tensions are all through the stories of Celtic saints. In fact, the two great themes that I’ve seen over the years is one, the idea that the place where you stand is holy and then the other idea is that you are seeking for the place of your resurrection. So in the Celts, there’s a great love of home and there’s a great love of place, to the point that they name places, name trees in their place but there’s also this longing to follow the call of God, what they call the peregrination, the journey, the pilgrimage. While there is much we don’t know about St Brendan, we do have multiple sources that attest to his life, his mission work, and his influence in the Celtic and greater culture. He appears to have lived sometime in the fifth to sixth century: approximately from 484 to 577. He was ordained a priest at age 26, and he spent much of his life in mission work, planting monasteries in Ireland, Scotland, Wales and Brittany. A Celtic monastery is the planting of a community and there is this rhythm of daily prayer and seasonal prayer but it’s also a place where they plant gardens. They build a school and the schools are the best in the land so usually the rulers would send their children to study in the schools and this is one of the ways they converted Europe. It is the hub of a wide-ranging community. They would go into the community, serve the poor. They would train people in skills, so the monastery becomes an outpost. They literally, some of them think of it as a community of heaven on earth. The Gospel of Jesus Christ went forth in word and deed and in print as these monks created and preserved Gospel manuscripts. We also have a hagiography of Brendan’s travels in search of the Isle of Saints. Hagiographies reflect the values of the time, and they might have some resemblance to things that actually happened. They are often dealing with an inner life, the life that is happening within the saint. So it’s difficult to parse out what happened and what didn’t. This type story represents some part of his actual journeys but the primary focus is revealing the inner life of the saint. So it is a spiritual tale. Barinthus, an aged monk, comes to visit Brendan. He is so overcome with emotion he struggles to Brendan his story. As Brendan calms him down, he tells of going to visit is son Mernoc who lived as a hermit with a small group of other monks. Mernoc invites Barinthus to travel with him to the Isle of the Saints, a place reserved for God’s holy ones after they have died. They travel around the island for many days, waiting for a sign from God about when and where they should stop. Finally a radiant man or angel appears to them and tells them that Lord has shown them a great gift by giving them a glimpse of this island. Those who live on the island need no food or drink and live in the light of Christ. He then explains to Barinthus and Mernoc that they have already been at the island for a year without any sense of time. The man walks them back to their boat and blesses them and they return home. When Brendan hears this tale, his heart is pricked with a longing to behold the glory of the Lord. Brendan asks Barinthus to bless him and his men as they pray and fast for direction. This initial encounter makes me think of how the Lord will awaken us with deep longing for Him and His presence. Just hearing another person’s story may provoke a sense of calling in some form of ministry or service. Three days go by before they find a harbor. As they climb out of the boat, a dog is standing there welcoming them. He leads to a large hall where there is fresh water for drinking and cleansing as well as a table set with bread and fish. After feasting for three days, they depart the island. A young an comes running after them, bringing a basket of supplies and tells them that their journey ahead is long and they will need these supplies for strength. As Holy Week arrives, they discover another island and decide to observe Maundy Thursday, Good Friday and Holy Saturday there. As they walk on the island, a flock of sheep approaches and Brendan says to take one sheep and prepare it for the meal. Then an older man walks up with bread and drink. He cares for them until Holy Saturday and then tells them that they will celebrate Easter vigil on a nearby island and then continue until they reach the Paradise of Birds island where they will spend Eastertide. As it turns out, Easter vigil is celebrated on the back of a whale. On the Paradise of Birds island, they behold a flock of birds who are actually angels. On Sundays and Feasts, they take the form of birds and join together on this island singing praises to God. Then they tell Brendan that he and his men will return here every Eastertide for a total of seven years. Every year for seven years, Brendan and his men travel the sea. Each year they spend Advent, Christmas, and Epiphany on an island with a group of cloistered monks who never speak. Then they will return to the island with the old man and observe Holy Week. They will spend Easter Vigil on the back of a whale, and Eastertide with the Birds of Paradise. The tale goes on and follows their story and along the way, outrageous things happen, some of which are close enough even though they’re far out to us, if you stand back from it, you realize it is describing something like they come up on one island and these hairy men come down and they’re throwing these fireballs at them and they have to scramble off away from the island. But if you read the story, it’s clearly describing a volcano. They have seen some kind of volcano and then they have another … It’s not an island, but they see these, what they call crystal pillars in the water, which are most likely icebergs. Each year, they celebrate all the feast days. The story is filled with lots of singing on these feast days. At one point they’re surrounded by sharks and the monks say, “Brendan, today when you say the office, whisper it. We don’t want them to know we’re up here.” So he sings it as loud as he can. The monks grow fearful but the sharks swim away. After seven years, they make it to the Isle of Saints. The story stops short of telling us much of anything about the island. They stay for three days, then the angel tells Brendan to return home for he is soon to come again. He returns home and dies soon after returning. Upon his death, he apparently returns and lives on the Isle of Saints. Here are three of the many themes we see in Brendan’s tale: a life of communion, a world of gifts, and thanksgiving in all things. 1. This communion is rooted in relation with God and others. Now the communion that we see in this story is a communion with God but with others. It’s a little group of people that are forced to live together on a boat for a long time. They have to learn how to get along. Looks very much like Jesus gathering the disciples and spending long periods of time with them. When Jesus says, abide in me and I will abide in you, there’s a tendency particularly at this point in our culture, in the western culture, to read that as an individual command but it’s very clear it would have been read by the disciples, by the medieval mind as a call to community, as a call to abide in him. It’s very clear in 1 John when he reiterates the command of abiding in me, he talks about some have gone off from the community. They’ve turned against the community and he literally calls them antichrists. Abiding is not simply a state of being, a spiritual state. It is continuing to live in relationship with people. I’m abiding in Christ but I am abiding in a communion, in a community. God creates a family. The church is his called out community and in the Celtic story, in all the Celtic stories, friendship is at the heart of their stories. It’s one of the great values in the Celtic world, is that we are called to be friends. They say a person without a soul friend is like a head without a body. We are called to be bound together in community. That’s part of the journey of holiness, is the community. Even Jesus in our passage today, just beyond the verses we read, verse 15, he says, “No longer do I call you servants for the servant does not know what his master is doing. I call you friends. For all that you have heard from my Father I have made known to you.” So we see this call to friendship, to communion. The journey of faith, of obedience, of the Christian life is a journey of a people. Paul speaks of this community as bride, as the body of Christ, a masterpiece, but primarily as a family. We learn how to obey, how to forgive, how to love, how to serve, how to use our gifts in communion with others. 2. As the monks travel toward the Isle of Saint, the Lord provides an abundance of food. While there is fasting and struggle in the story, there is quite a bit of eating and even feasting. Then we see in this story and of course in the story of the disciples in scripture, this world of gifts. I mean it’s such a strange story and fun, but food just constantly appears. It’s actually whereas a lot of saint stories will talk about people fasting almost in an unearthly way, some of which they never even eat, this story’s not like that at all. They eat all the time. They’re always going to feasts. Every time they land on an island, there’ll be food spread for them. There’ll be a great meal. They are feasting for days. God is gifting them and us. He’s surrounding us in it. We are born into a world of gifts. If you think about eating in the gospels, it’s everywhere. Jesus is eating with the disciples all the time. He’s eating with Zacchaeus. He is feeding 5000 and there’s abundance. There’s a lot of food left over. Eating is really important, just this eating is simply a sign of this abundant gifting that God gives us that goes way beyond food. Bread, family, music, all gifts. Everything in life becomes a gift which is what the Celts actually more than anything else helped me open my eyes to, that the whole world is gift. Everywhere I turn is gift. Every day, the Lord is filling our lives with gifts: big and small. From each breath to the joy of family to the sounds of music: all gift. In fact, the picture of spiritual life in the story might best be captured as a group of friends rejoicing over the gifts of God and giving praise to God as they do. 3. The only response is a life of worship, a life of thanksgiving so it is characterized both by spontaneous prayer and worship and prayer in fear with the sharks surrounding them, but also rhythms of prayer. The prayer of living into the year, living into the different seasons. It’s fascinating that they have to celebrate all the seasons the same places every year, so they follow the cycle of worship every year. It’s a life marked by remembering and rehearsing the deeds of God and Jesus Christ which sounds very much like the New Testament church. People that are marked by prayer and worship. We see this in Acts and actually, the Orthodox writer Thomas Hopko goes so far as to say the book of Revelation is what taught the Orthodox church the liturgy. He says, “We don’t try to figure out all the mysteries in the book of Revelation. We simply try to do it. We try to worship the Lord like the writer of Revelation.” So our only response to the overwhelming goodness of God is prayer and thanksgiving. This is not exhaustive but it gives us just a glimpse into the beauty of Brendan and even the beauty of what a life of abiding looks like, of communion with God but communion with others and they both grow simultaneously. They don’t grow separately. A life where we’re learning more and more how much God blesses us, that we live not in a world of scarcity but in a world of abundance. He’s always overwhelming us, a life of giving thanks, constantly returning thanks.